Volkswagen owners are pretty loyal to the brand. When they discovered that the Volkswagen’s reputation for durability was well-deserved they made it their preferred option for road travel. For Volkswagen services that keep you on the road for as long as you need your vehicle, come to Precision Auto. We design Volkswagen services according to your vehicle’s age, your driving habits, and the manufacturer’s recommendations. Our maintenance services are clean and consistent so that you stay ahead of any repairs and breakdowns. We know how to make sure you get the most out of your investment. Protect your Volkswagen engine with our quality oil changes, tune-ups, lube services, and diagnostic services. Our ASE Certified technicians know your Volkswagen’s full potential and the service plan to reach it. Our team stays proactive with its total car care for your Volkswagen. 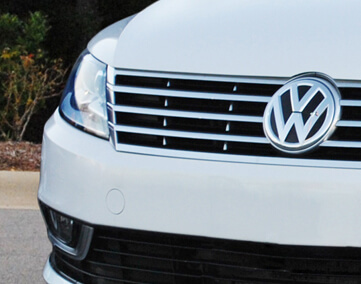 Trust our team that knows how to handle every Volkswagen service, from minor to major repairs. Normal road travel can cause problems and our techs will identify and address these potential problems before they can compromise vehicle performance. All we need is your trust and your Volkswagen in our care. Bring us your vehicle as soon as you notice any issues with your vehicle’s performance. If you hear strange noises coming from your engine, transmission slipping out of gear, or your braking system wearing down through the pads, our team can fix it. From bumper-to-bumper, we have you covered. All of your engine, mechanical, exhaust, or electrical system repairs will be handled with precision and efficiency. Your Volkswagen was built to last. To ensure that durability, you need to keep it under the care of our experts. Precision Auto is the preferred auto repair facility for all of Germantown’s Volkswagen drivers. Our team is waiting for your call and is ready to get you on a path to optimal performance. Friendly and professional techs can be reached at 301-917-2682. Schedule your next Volkswagen service appointment today! To save yourself some time, go ahead and use our convenient online scheduling system. Next time you’re in the area, be sure to stop by to meet the experts. We’re much better than the expensive dealerships and perform the same expert-level services.